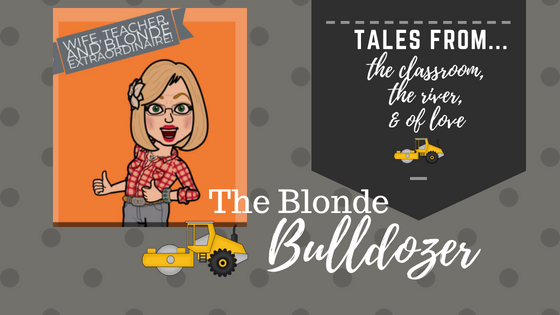 Those who know me, know that the name of this blog "The Blonde Bulldozer" fits me to a "T". I have always approached my career with a blazing vigor at "900 mph with my hair on fire" as it has been described. More to the point, I have always had a hard time saying a very short word "n-o". For or the last 8 years, teaching in Phoenix, my specialty was SENIORS, because I approached them with a bulldozing attitude - take no prisoners and failure was NOT an option. I, however, started my career teaching 9-12 German and Language Arts, but sort of "morphed" up the grade food chain, to almost solely seniors. I loved having seniors, they were easy - so-to-speak. Their behavior rarely required my attention, and they governed their own. If one of the students was a doorknob, or behaving like a doorknob, then the others would promptly respond with far better than I would come up with; usually threatening beatings, or putting their classmate "on blast" as they say. Please don't get me wrong, each year I usually had at least class or a couple of students that were satan's spawn, or what we would call the "sweat hogs" OR a students that would make me want to slam them through the window, only once or twice. Since I have come to Sand Point my class make-up has drastically changed. I now teach 7-12 grade and my LEAST favorite are the seniors. My favorite class is the 7/8 grade combined class (I know, shocker, right!). They are fantastic! They swallow everything up like little sponges and the discipline they require is minimal. I think, they are still so shocked to be included with the high school that they are just...sweet. They also still bring the teacher stuff for holidays and other "just because" moments. Finally, they do not hesitate in showing their enthusiasm for iPad usage, all of my "little" projects, and the fact that I have their class 2 hours a day - both starting and ending my day with "the Littles" as I have come to call them. They are truly a unique little bunch of pickles. My most recent teacher surprise, is a bit of local fare called pickled fish - handmade and canned by one of "the Littles" and her mom. She gave me a bit of instruction that "it is brand new and I needed to let it pickle a little more" but her cute face was beaming as she told this desert dweller all about it. As my other students saw it on my desk throughout the day, they were quick to ask "Mrs. Seiler, where'd ya get the pickled fish" and "ohmigosh, that is amazing" OR "did so-and-so make that, wow, you're in for a treat...it is soooo good!" They also each one told me or tried to describe what it would taste like (I have no clue). Since about 90% of the school is related and they all have been together since birth they knew exactly who made this particular batch of delectable delight and were sorely jealous. I personally cannot wait to try it...here's to the Littles and a new treat!